No, we’re not talking about VW cars belching out masses of nitrous oxides. 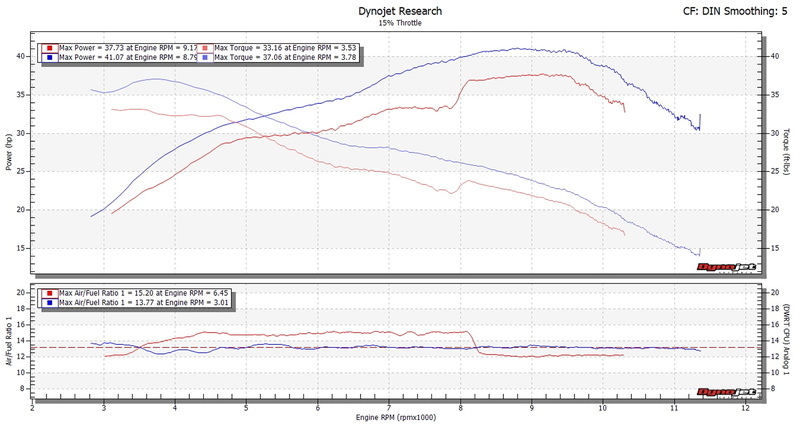 Rather, the effect of Euro emissions regs on our long term GSX-S1000 F. We’ve been speaking to the good guys at Dynojet UK, about getting a Power Commander fitted to our bike. They’ve been working hard at developing a unit for the bike, and been going through the mapping changes needed. We’ve seen some of the before-and-after graphs of the GSX-S, and they’re pretty interesting. First, a bit of explanation. A Power Commander is a clever box of tricks, which adjusts the fuelling of the engine right through the rev range, at various throttle openings. So if there are any spots in the engine’s power curve where the petrol/air mix isn’t quite right, the Power Commander can be set to adjust it until it’s exactly right. That’s usually when you fit a different exhaust system, or air filter/intake setup, but it’s becoming increasingly important on standard bikes. Emissions rules are being tightened all the time, and next year sees another step up to Euro 4 rules, which further limit the (already tiny) amounts of CO (carbon monoxide), HC (unburnt hydrocarbons) and NOx (nitrous oxides) allowed in a bike’s exhaust gasses. So, once the Power Commander is fitted to a bike, it’s all loaded onto a dyno, and the tuner can run all through the rev ranges, at various throttle openings, while an exhaust gas analyser ‘sniffs’ the exhaust to measure the amount of oxygen. 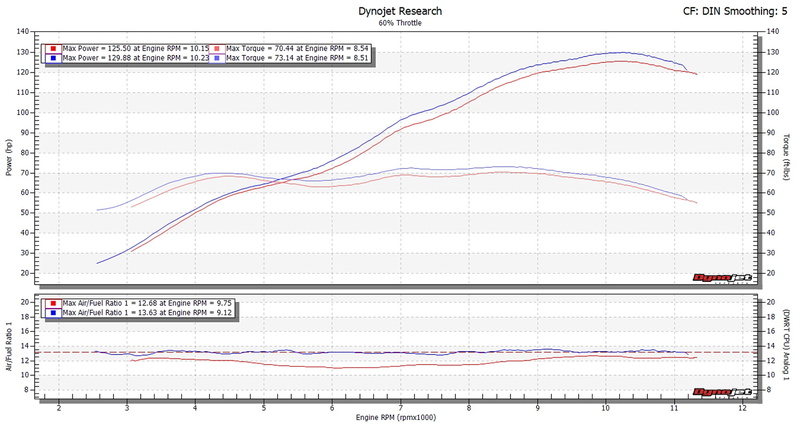 That in turn lets the dyno calculate the air/fuel mix inside the engine at each point in the rev range. If the mix is wrong, either too much fuel (rich), or too little fuel (lean), then the tuner adds a correction factor into the Power Commander’s memory. 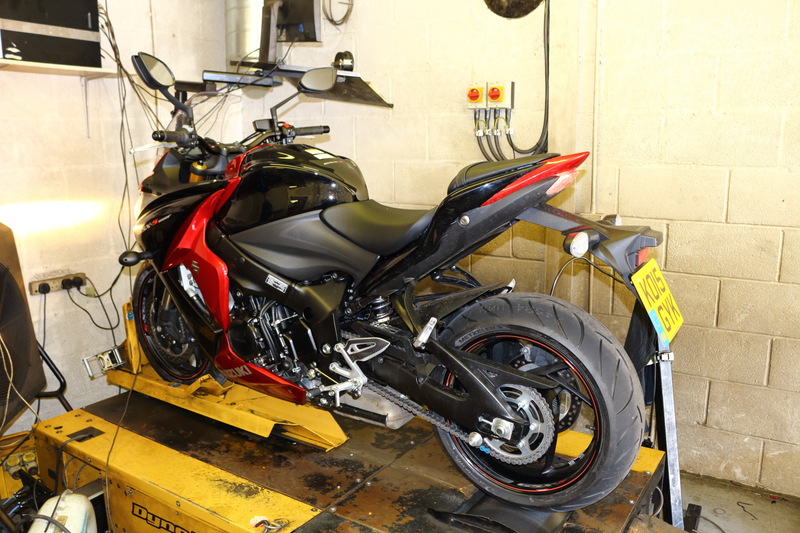 So, say, if the bike is running at 5,000rpm, with 20 per cent throttle, and the air/fuel mix is a little bit rich, then the dyno operator will tell the Power Commander to reduce the amount of fuel fired out of the injectors at that point. After a full session on the dyno, analysing the fuel mix at all throttle positions through the rev range, you get a full ‘map’ of fuelling changes needed to give the perfect fuel/air mix all the way through the rev range, which will give better running, more power, and improved economy. Phew! So, back to the GSX-S1000. 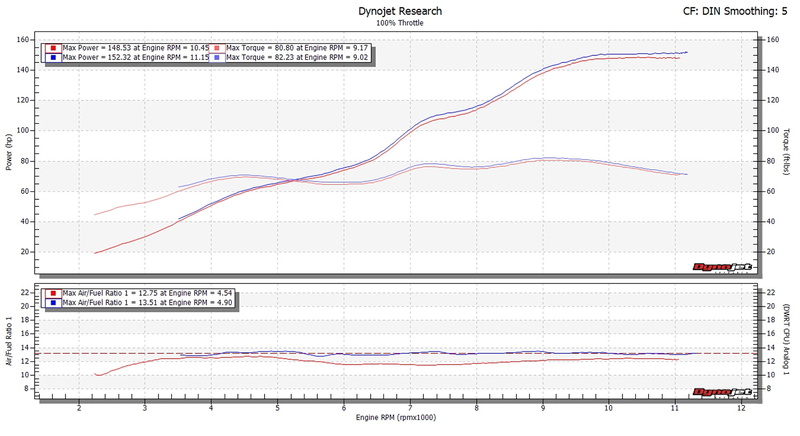 Dynojet UK has been developing a map for the stock bike, and the guys there have sent us some of the graphs of the before- and after- changes (below). And they’re really interesting! First up, red is before mapping, and blue is after. There’s a graph for each throttle position, for 10, 15, 20, 40, 60 and 100 per cent opening, with the top graph showing the power delivery, and the lower graph showing the fuel/air mix (the dotted line is the theoretical ‘perfect’ mix). Now, starting at 100 per cent – you can see that the stock power curve isn’t so bad at all. But the fuel-air mix is out all through the midrange up to 10k, running a bit rich all the way through. The Power Commander reduces the amount of fuel going in at this point, giving a nice little boost to power all the way through the revs, adding nearly 4bhp peak. Remember, this is a stock bike, with no changes apart from the Power Commander. Let’s go to the other end now – down at ten per cent throttle. Now, you might think you’re a hero and never spend any time here – but think of all the time you’re trickling through traffic, or gently feeding in the gas out of a slippery bend. You probably spend much more time at ten per cent than you think – and look at the curves! The air/fuel mix is very lean all the way to 8,000rpm, when it suddenly switches to rich. 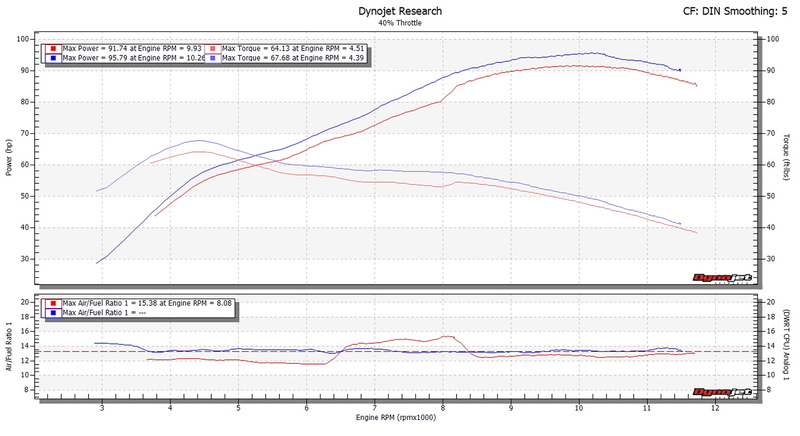 And the power/torque curves are very wavy, up and down and all over the place. 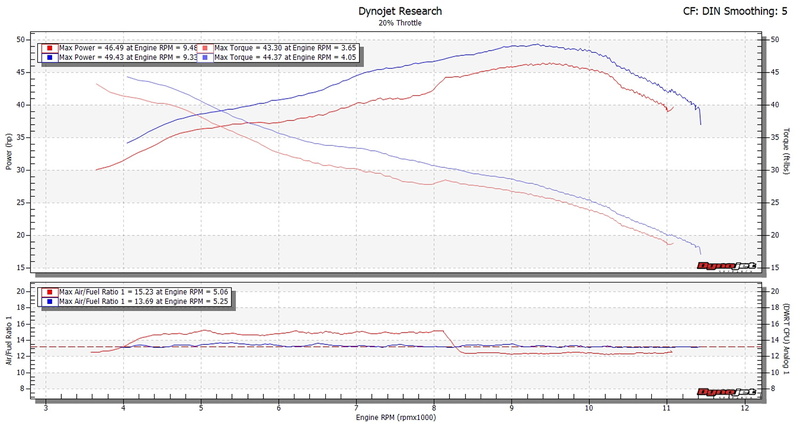 Compare with the blue lines, where the torque line is much smoother, with a nice straight curve. Of course, the numbers are very small, and the curves curtailed because of the low throttle opening, but you can see the difference in how the curves are massively cleaned up. The 15, 20 and 40 per cent curves tell much the same story, with the big jump in fuelling around 8,000rpm, and concomitant steps in torque. 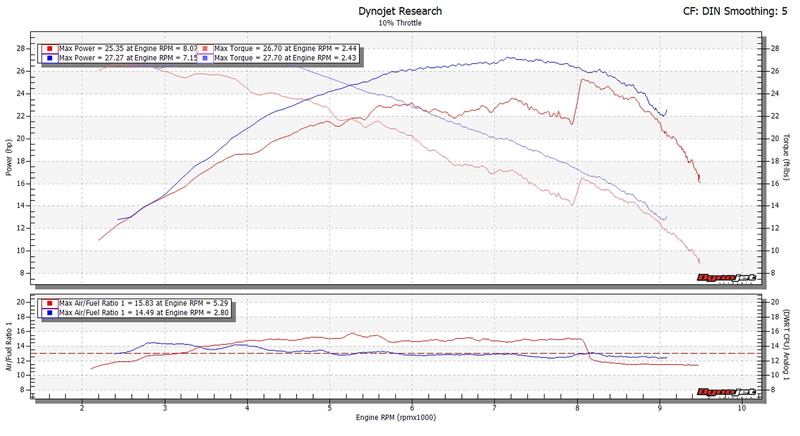 The Dynojet mapping cleans all this up, and transforms the curves all the way through, adding big chunks of power, particularly at 8,000rpm. Note the graph for 40 per cent throttle – it’s adding nearly ten bhp at that point.